Whether it's riding flat out on a rolling forest trail or maneuvering the technical twists and turns of a tight single track, mountain biking has become a popular regional sport. So if you're a "Fat-Tire Fanatic", don't forget to bring the bike! All State and County forest roads and trails are open for mountain bike riding unless specifically posted. Roads and trails within the Tamarac National Wildlife Refuge are NOT open to mountain bikes. 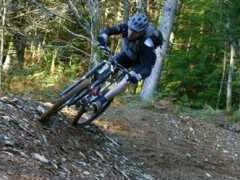 For more information on mountain biking within State Forests, please see the Mountain Biking page from the MN DNR. For the nature lover, Dunton Locks has 3.8 miles of hiking/mountain biking/cross country ski trails located on the hills above the Eagles Picnic Shelter and along the shores between Lake Sallie and Muskrat Lake, south of the bridge. The northern trails wind through hardwood forested hills once a gathering spot for the Sioux Indians. Remnants of Indian burial mounds are still present throughout the park. In fact, much of the park area was a gathering area for netting tulabies, camping, and trading. The southern trails also wind through rolling, wooded terrain, however much of the trails are located on private land owned by the Soo Pass Ranch. This land is used for camping during the several music festivals the Soo Pass Ranch holds each year. The 3 miles of single-track trails at Mountain View Recreation Area wind their way through a mature, mixed hardwood forest. The terrain may look overly challenging, but the trails are laid out to be challenging without being daunting. These trails offer several different loop options. Wider trails for hiking, horseback riding, and cross-country skiing (in season) are also located within the recreation area. The single-track trails will cross the other trails at various locations. Please be aware of other trail users in the area. Parking for 10-15 vehicles is located along Tower Road.